Are Millennial Women Going To Break Through The Glass Ceiling? We still have a long way to go before women will enjoy equality in the workplace, but the women and men of Generation Y are pushing things forward. According to a recent infographic released by Human Resources MBA the glass ceiling is starting to show some cracks. Currently, women still only make 77 cents for every dollar earned by men. Women are more likely to be passed over for high-profile assignments and men tend to manage much larger workplace budgets than women. However, though fewer women aspire to be in management than men, Millennial women do aspire to management more than the generations of women before them. Millennial women are more educated than Millennial men and more concerned about career success. Things are changing. Sixty-seven percent of Millennials, men and women, think more needs to be done to enhance gender equality in the workplace. 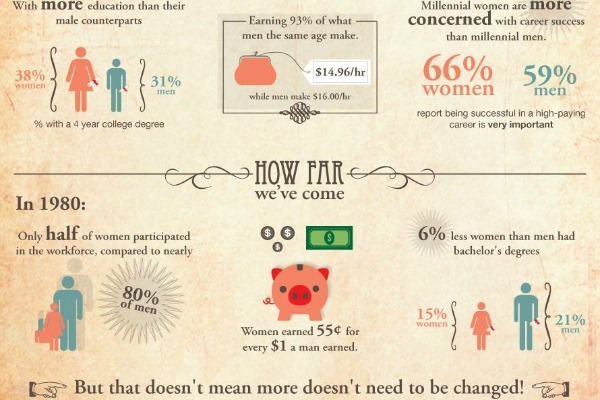 While women are still languishing behind men in pay and advancement, things are definitely changing for the better. As more Millennials make their way into the workplace and positions of power, no doubt the rate of improvement will increase. Millennials are a large and powerful workforce that has already changed the way we work and the way we think about work. Expect great things for women, too.